Sometimes a simple change can make a big difference. 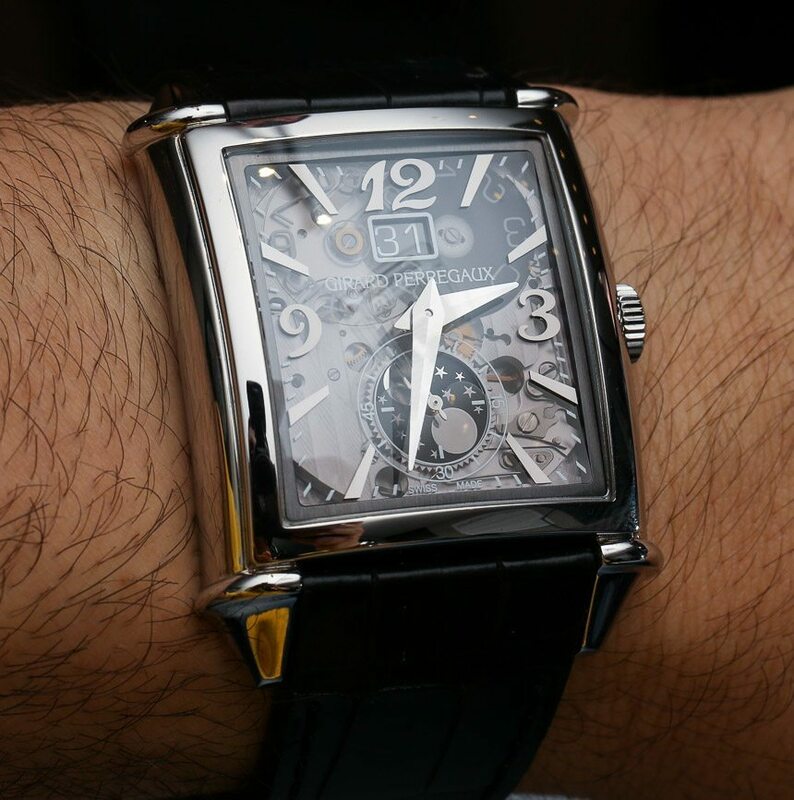 Take for example, this Girard-Perregaux Vintage 1945 XXL Large Date and Moon Phases watch with a transparent dial (UPDATE: Girard-Perregaux has now added the name “Mechanics of Art Deco” to the title of the watch). 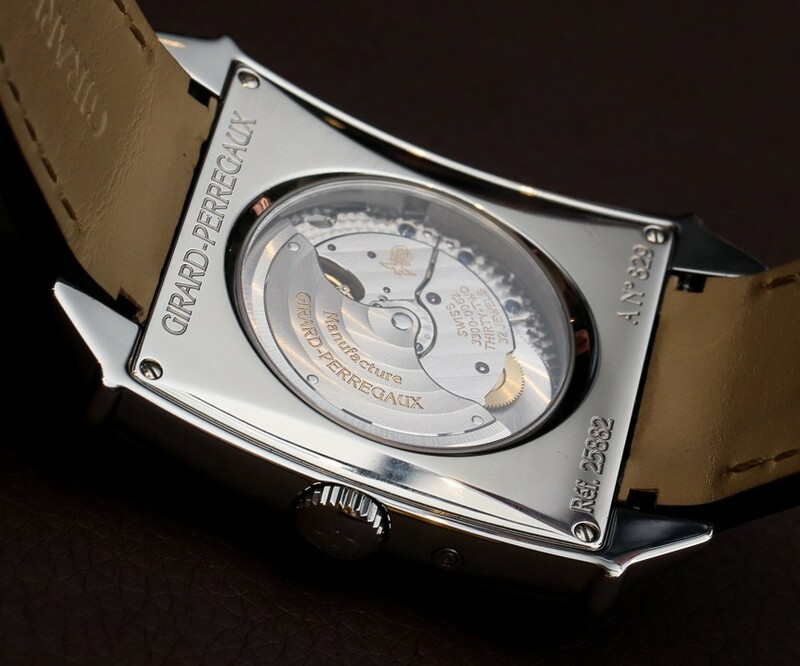 Girard-Perregaux added a gray-tinted “smoked” sapphire crystal to the construction as the dial piece, which offers a view into the movement as well as a complete dial. This isn’t a skeletonized dial because the full dial is still there, but rather a “transparent” version of the original which offers a totally new look. The brand feels that the Girard-Perregaux Vintage 1945 XXL Large Date And Moon Phases watch with the sapphire crystal dial is a more modern interpretation on this more classic design. “Vintage” is even in the name of this timepiece, so it is interesting to see this blend of more traditional and modern characteristics. I quickly fell in love with the design, given how cool it was to see the movement on a watch with a traditional character. 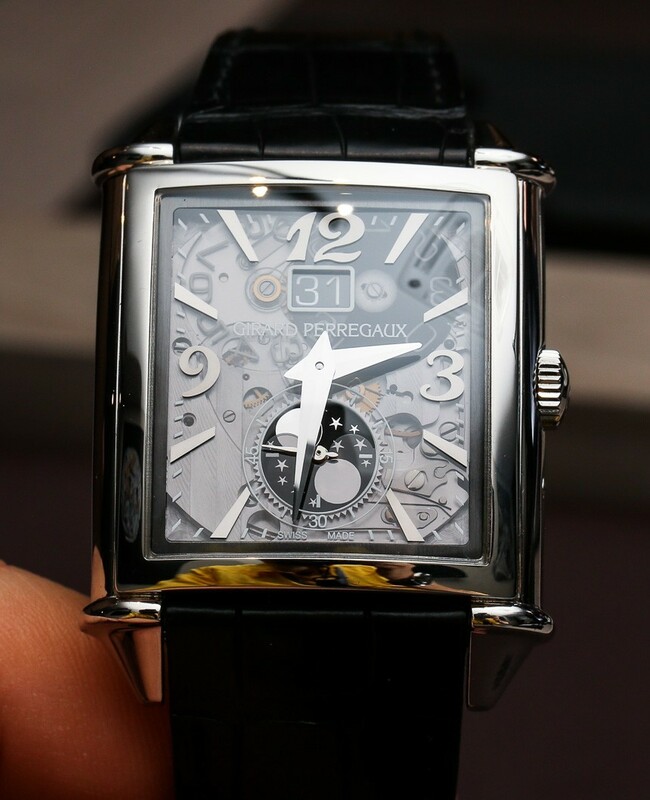 If you’ve never worn one of Girard-Perregaux’s Vintage 1945 XXL watch cases I recommend that you do. The “XXL” part of the name is a bit misleading given the 35.25mm wide by 36.10mm tall case size, but what is important is how it fits on the wrist. 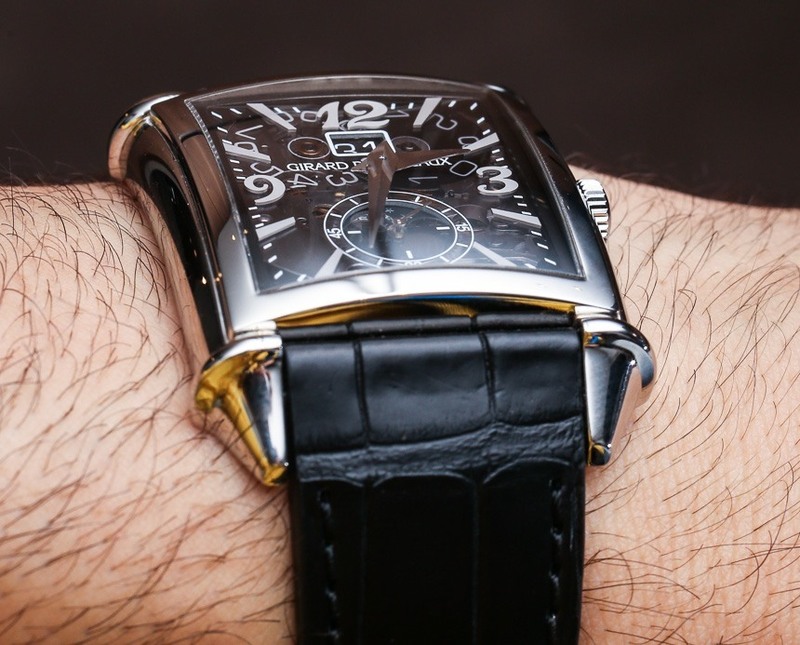 You can see that Girard-Perregaux designed the case to literally bend around your wrist. The curved case is very distinctive looking and nothing else really fits like it. 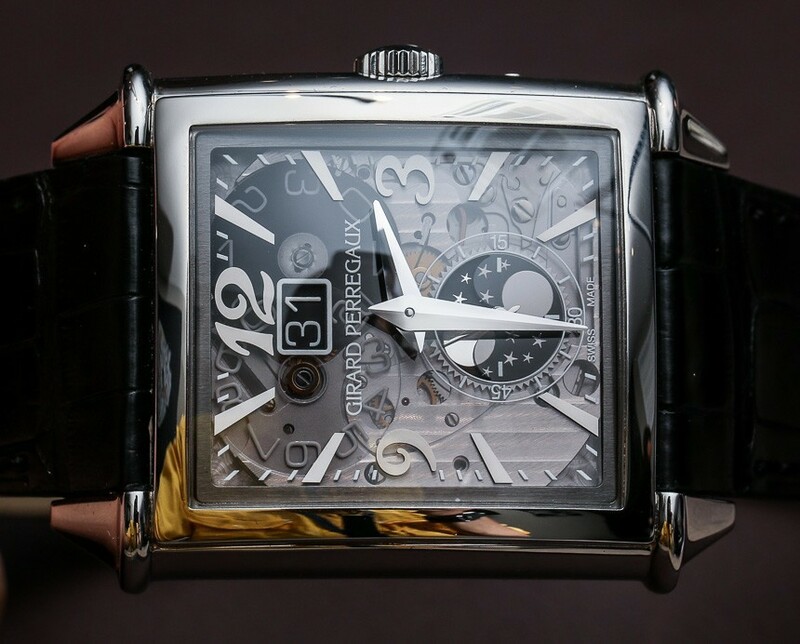 The Girard-Perregaux Vintage 1945 XXL case even creates the illusion the that mechanical movement inside is curved as well, which is not the case. The case is actually relatively thin, being just 11.74mm thick. It makes for a wonderful design and enjoyable wearing experience. It helps that it is also comfortable and very attractive looking. 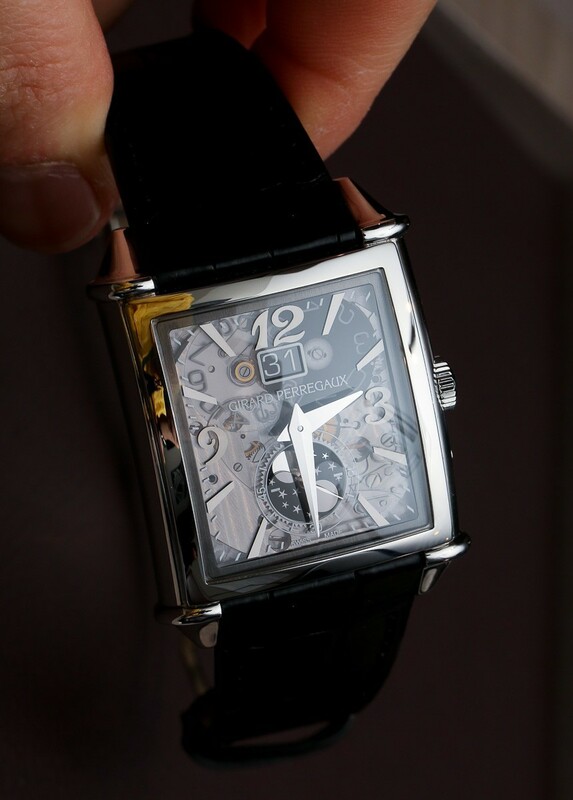 Of course, there are similarities to the Jaeger-LeCoultre Reverso in theme, but there is nothing wrong with that, as Girard-Perregaux offers a distinct look. Girard-Perregaux will offer the Girard-Perregaux Vintage 1945 XXL Large Date And Moon Phases watch in both polished steel and 18k rose gold. I only got to see the steel version, but given the smoked style of the sapphire crystal I have a feeling that I will enjoy it more given that the gray colors all work better together. 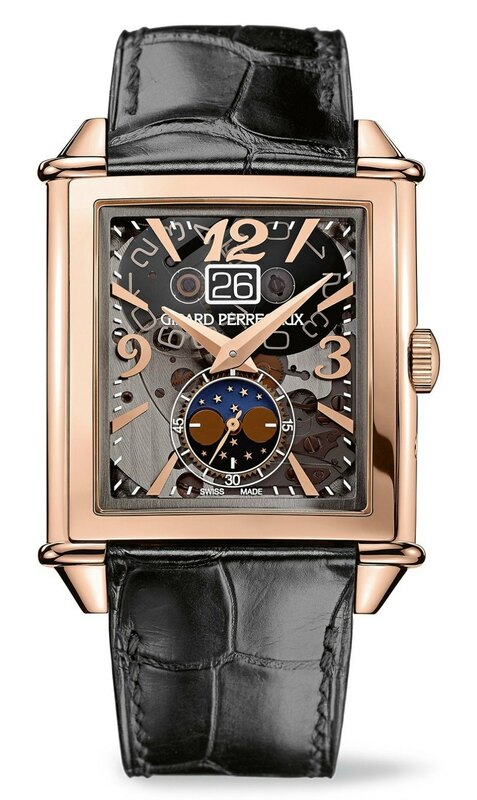 Having said that, the 18k rose gold model might just surprise me when Girard-Perregaux releases these models with the transparent sapphire crystal dials later in 2014. 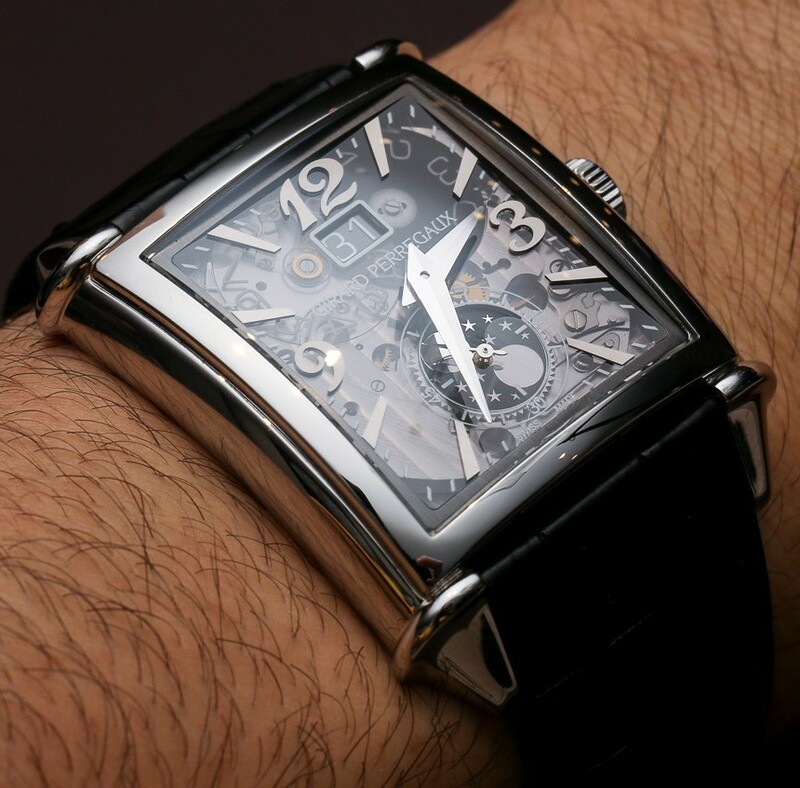 One of the things that Girard-Perregaux got right in the design of the Girard-Perregaux Vintage 1945 XXL Large Date And Moon Phases watch with the transparent dial is the mixture of transparency and legibility. This watch could have easily been a monumental collage of dial confusion and people’s eyes may have struggled to identify dial elements from movements elements. That isn’t at all the case. The attractive dauphine-style hands and polished hour markers are the most legible elements on the face, and that is a very good thing. The visibility of these primary elements above all else allows for the Girard-Perregaux Vintage 1945 XXL Large Date And Moon Phases watch to boast an impressive level of legibility given the transparent theme. The other dial indicators include the big date window under 12 o’clock (thankfully with black discs), and the subsidiary second dial and moon phase indicator above 6 o’clock. These elements as well prove highly legible and attractive while mixing readability with a sense of transparency that allows you to look into the dial. Also, the big date indicator window moves from one date to another instantly, rather than slowly over time. While the movement sitting under the gray-tinted sapphire crystal was not meant to be shown off in this manner, it looks quite nice in its exposed state. Nicely polished, I am glad that Girard-Perregaux did not feel the need to skeletonize or embellish the movement in any particular manner. It is just the nice Girard-Perregaux caliber GP03300-0105 automatic movement doing its thing with a bit extra voyeurism added to its normal operation. The GP03300-0105 movement is in-house made with a module for the complications on top of Girard-Perregaux’s base caliber. 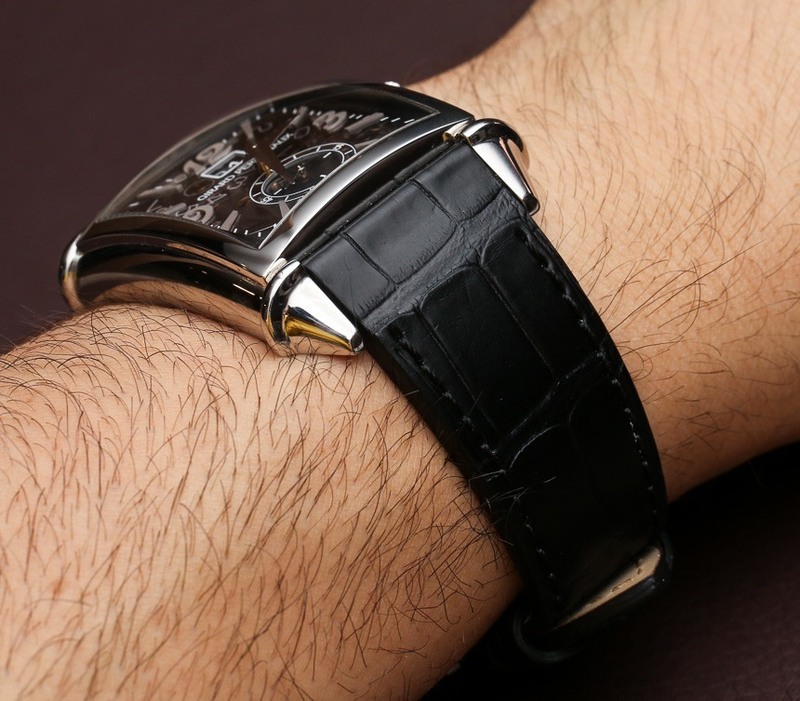 It operates at 4Hz (28,800 bph) and offers about 46 hours of power reserve. Of course, it is an automatic with the rear of the movement visible through the caseback sapphire crystal. In a sense, what Girard-Perregaux really did is take the theme of an exposed caseback and move it also to the dial-side of the watch. I’ve been waiting for Girard-Perregaux to release a slightly larger version of the Vintage 1945 XXL with simple dials such as this. They do have larger versions of the case, but they are often paired with much more complicated movements and are relatively thick as a result. 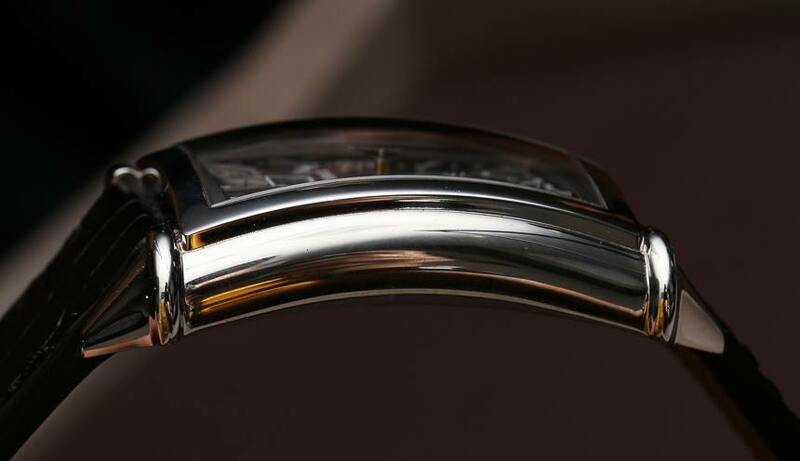 A grander version of this curved, relatively slim case would be really interesting and might perhaps offer a highly marketable non-round watch. 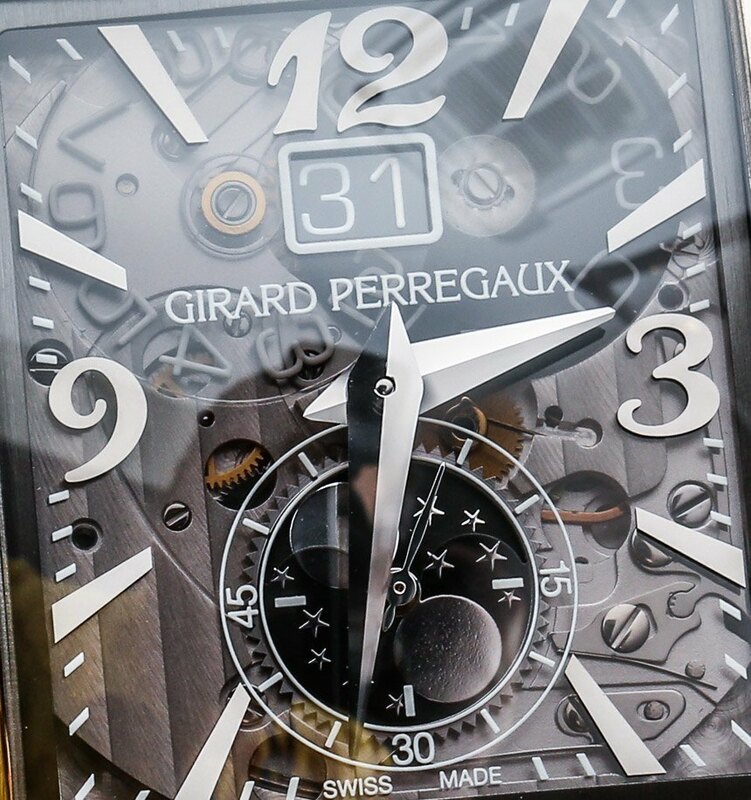 Attached to the Girard-Perregaux Vintage 1945 XXL Large Date And Moon Phases watch collection are attractive black alligator straps. These straps are elegant because they don’t have contrast stitching, but I still prefer rolled-edge straps a bit more that have no visible stitching. Overall, while these smoked sapphire crystal dial versions of the Girard-Perregaux Vintage 1945 XXL Large Date And Moon Phases are going to be more niche models, they add some serious coolness to an otherwise sober looking vintage-style watch collection.